Prof. Michela Alessandra Denti obtained her PhD in Biological Sciences in 1997 from the Scuola Normale Superiore di Pisa, Italy, working on the in vivo application, the intracellular localisation and the association to RNA-binding proteins of a newt hammerhead ribozyme. She then went on to do postdoctoral research at the Institute of Molecular Biology and Biotechnology, Heraklion, Greece, under the guidance of Prof. Martin Tabler and Prof. Mina Tsagris, studying plant RNA pathogens, their interaction with RNA-binding proteins and their involvement in post-transcriptional gene signaling (1998-2001). During a second postdoctoral research period in Prof. Irene Bozzoni’s laboratory at the Department of Genetics and Molecular Biology, “Sapienza” University of Rome, Italy (2002-2007) she was involved in the development of the antisense-U1snRNA mediated exon skipping therapy for Duchenne muscular dystrophy and in the development and application of DNA vectors for RNA interference. 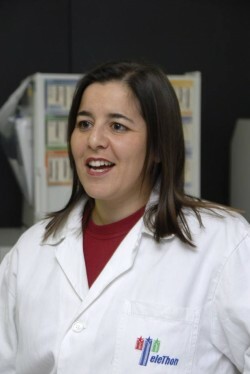 Since 2008 she is Principal Investigator of the Laboratory of RNA Biology and Biotechnology at the Centre for Integrative Biology of the University of Trento, Italy, first as Assistant Professor of Molecular Biology (2008 – 2014) and then as Associate Professor of Applied Biology (2014 – present). Her laboratory has two main research interests: modulation of RNA splicing as a cure for inherited diseases and microRNAs as biomarkers of cancer, cardiac and neurodegenerative diseases. Research in her laboratory was/is funded by grants from Telethon Italia, the Italian Ministry of Health, the Italian Ministry of Education, University and Research, and the Autonomous Province of Trento.